Brand new issue of New Perspectives (1/2018) is now available! 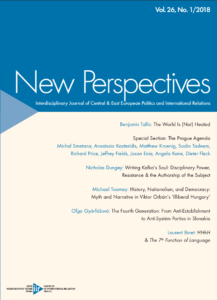 We are delighted to present issue 01/2018 of New Perspectives, a peer-reviewed journal published in English, which primarily focuses on interdisciplinary research of Central and East European politics. Articles published in New Perspectives are always based on strong theoretical framework and use sound methodological instruments. In order to ensure that these high standards are met, every article submitted for publication undergoes the process of peer review - at least two or three world's leading experts in the field concerned are asked to submit their review report on the article. You can find these articles in our new issue of New Perspectives journal ! Soon available in our e-shop. To convey its results to the broadest possible audience, the IIR joined the movement called Open Access and provides all of the contents, both old and new, of our scientific journals New Perspectives and Mezinárodní vztahy / Czech Journal of International Relations for free via the Internet. The articles are available under the licence Creative Commons Attribution-NoDerivatives 4.0 International (see https://creativecommons.org/licenses/by-nd/4.0/deed.en ). The journal Mezinárodní vztahy / Czech Journal of International Relations is accessible online. Our books are accessible at Google Books (https://books.google.cz/). Our Czech language books are accessible online after an expiration period of one year, and our foreign language books are made available online after a two-year embargo. Older issues of the journal Mezinárodní politika, which today we publish only online, are available as free downloads, but one can purchase physical issues of the journal in person in the building of the IIR. All of our publications and 80.000 other books and documents are available in our library. We wish you a pleasant reading and fruitful use of these documents!